Written on October 31, 2007 by Kevin. One parent to another, you should read this and be informed. Is it just me or is the classic It's The Great Pumpkin Charlie Brown movie boring now? I recall watching this and the other television specials as a kid but I tried to watch it last night with Rylan and neither one of us were too entertained. Halloween can be a great time of year for parents. Adult costumes like a Santa suit make great Halloween costumes or holiday costumes. Creepy costumes can be used to scare children and make Halloween even spookier! Written on October 30, 2007 by Kevin. Congradulations to LauraP. You are the random winner of the Bob device. You will be contacted shortly. Thank you everyone for participating in this giveaway. I encourage all of you to look at the Bob website and don't forget about the WebGoonies promotional code for 10% off + free shipping. First off, I would like to thank Neil from Hopscotch Technologies for allowing me the opportunity to review this product. Our family loves to be the guinea pigs for products. Onwards, Hopscotch Technologies introduced me to their new product called Bob which is a screen time controller. What is that you ask? Well its quite simple actually. 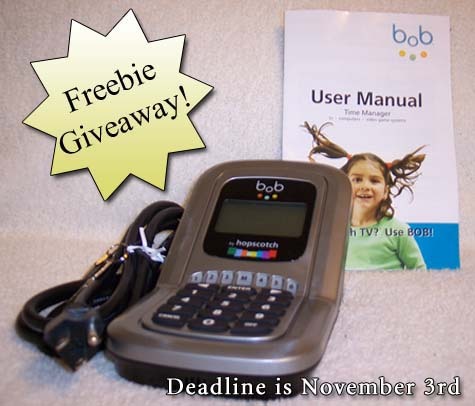 The Bob is a hardware device that can be hooked up to a television, computer or anything else electronic that you don't want your kid to operate for long periods of time. The bottom line is that too many kids watch too much television and this device is meant to alleviate the problem of having to tell your kids to turn it off. Simply hook your television to it, program the master account and then program your kids accounts. Each individual account (up to 6) can be programmed to allow certain hourly, daily or even weekly limits. When those assigned limits have been met, the television shuts off. Simple. I felt like a bit of a fool when I first pictured this device in my head and how it would work. I figured your television would plug into the Bob device which then plugs into the standard power outlet. The kid would have to simply unplug the television and redirect it to the power outlet. Of course this wouldn't work and that is why once you plug your television into the Bob, there is a lock and key that prevents it from being removed. Why didn't I think of that? Setting up this device was super simple. They provide a helpful guide and even throw in a bit of humor along the way. I went through the guide and setup my master account and two others for Rylan and my wife. Piece of cake. Each account has a individual pin which logs in that specific user and their time begins then. Rylan is a bit young to use this himself so I activated my wife's account without her knowing. It wasn't too long before her television access had been revoked and she came looking for answers. It worked, perfectly. This device does the job well and they seemed to cover everything including the need to add additional time to someones schedule quickly. For example, when you just need 15 more minutes to watch the last of your ballgame. The Bob device will certainly be used in our house as the kids get older and more independent. I can most certainly see the benefits of this at keeping your kids television or computer access to a reasonable amount. The only thing that I found as a slight negative was the overall size of the device. Most of the size though is because of the need to lock the power cord into the unit but we did have an interesting time trying to find a place to leave this and still be accessible. Hopscotch Technology is running a special right now on their website offering free shipping this week. Also, as a WebGoonies.com reader, they are offering an additional 10% off coupon until November 4th. Use discount code WebGoonies during the ordering process. Want a free Bob for your own family? WebGoonies.com is proud to be offering it's first giveaway. Please leave a comment on how you think having a Bob would help your family and on November 3rd, we will be picking a random winner. Spread the word! Written on October 29, 2007 by Kevin. My wife and I had been looking forward to seeing Rylan at soccer practice for a while now. 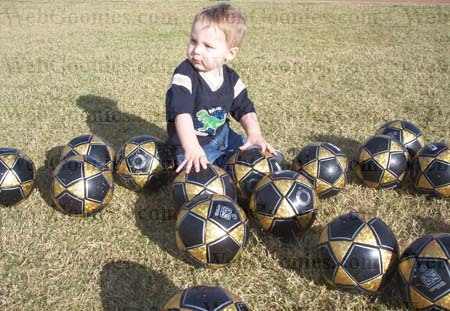 We could just picture Rylan running around with the other kids trying to kick the ball. I woke Rylan up super early in the morning so that we could get dressed and out the door in a timely manner. As he woke up I asked him if he wanted to go play soccer. He let out a "No" and I'm pretty sure he then said "I'm tired". I definitely wasn't expecting that. It took a bit for everyone to get up and ready to leave and I quickly noticed that we were running late already. Off we went, expecting to be there 10 minutes late. Soon after hitting the road I frustratingly said "We are out of gas". Now this is a pretty common phrase out of my mouth but I am pretty good about judging how much gas is in the tank regardless of where the needle says so we continued on not wanting to be any more late. 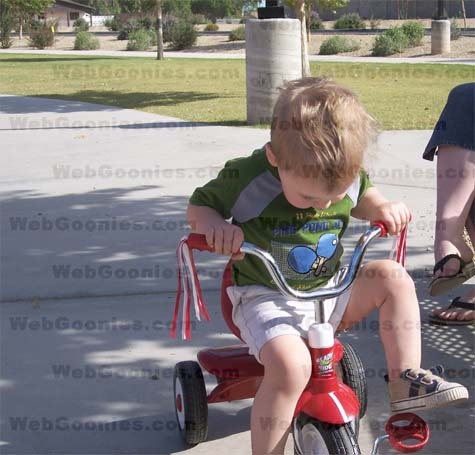 As we made our way to the park where his soccer practice would be at, I could feel the car starting to chug. I pulled into the parking lot and could feel it gasping for its last bit of fumes. There it was, the engine had cut off. I used the momentum of the car and a bit of manual power to coast it into the nearest spot. We rushed to Rylan's practice now 10 minutes late. Rylan, as expected, was pretty crazy at his practice. He loved playing with the soccer balls but I'm not sure if he ever recognized that he was supposed to be doing what everyone else was. The class is for 2-3 year olds which made it a bit difficult. The coach was talking to the kids like they were a bit older and didn't seem to tailor it at all for the fresh 2 year olds. Rylan was more interested in throwing the ball rather than kicking it like he occasionally does at home. He did however meet a girl. She was only 14 months old but they seemed to enjoy each other. Rylan got his own little soccer t-shirt to wear to practices. Word of advice to anyone setting up a soccer event for little kids. Don't put it right next to a playground. The kids will be distracted by it and only want to play there. We will be taking Rylan to soccer practice for the next 5 weeks and do a bit of comparison as the weeks go on. We'll see if he begins to pay attention a bit more. Written on October 26, 2007 by Kevin. Written on October 26, 2007 by Rylan & Kaitlyn. So most important things first. I have a new bedroom! It's amazing. Mom and dad finally moved me into our second bedroom and set it up all nice for me. I have Disney decorations including Mickey for me and Pooh Bear for Kaitlyn. She is hanging out in my room also but now she is in the crib rather than bassinet. I think it's going to be fun to be up all night just talking to her about crazy and random things. It's great. Thanks mom and dad! Second, I start soccer tomorrow! It's going to be fun I think but I don't look forward to waking up super early to get there. It isn't super cold here in Arizona but still chilly for me in the morning. Dad had better turn the heater on for us kiddos. I think it's going to be fun running around kicking the ball. My dad will definitely be getting pictures. I have some definite exciting news about next week. My dad will be having a giveaway for a new product that he has reviewed. It is awesome and you will definitely not want to miss it next week. 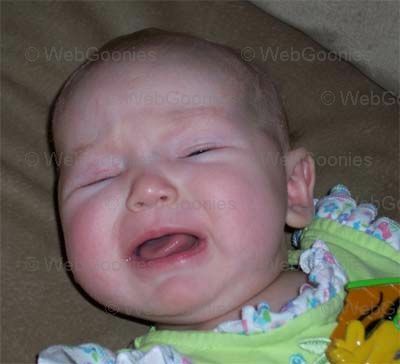 Kaitlyn is getting old now and has begun teething. Now I am stuck hearing her cry because of it and sometimes she even spits in my face because she is drooling so much. It's not very nice of her but I understand because I went through it not too long ago. We'll get through it together. We took a trip to my grandparents house last weekend which was pretty fun. We went out for ice cream, bought a few pumpkins and even went to the park. Needless to say, I was pooped on the drive home and went right to bed. My new word for my grandpas is Pa Pa. They love when they see me running towards them yelling Pa Pa! I guess that's it for now. Have a good weekend. Written on October 25, 2007 by Kevin. I was sitting in my kitchen last night talking to my wife about things that we wanted to do with Kaitlyn and Rylan as they got older. The talk was centered around what we wanted to do for Halloween and other holidays in the future. Things that we would like to become traditions and other things that are more spur of the moment. This conversation made me think about when I was a kid and had gone to sleep, what did my parents talk about. Did they talk about the next 15 years and how exactly they wanted to spend the time as a family or did they just wing it as they went? Every parent must have dreams for their children but do you spend time talking it over with one another? There are many traditions that we want to bring to the kids and many other fun things to do with them as they get older. Last night the talk was about making holiday chocolate candy with them in a few years. It's a nice feeling being on the side of making the plans rather than just going through with them as a child. Someday, Rylan and Kaitlyn will be in my shoes and get to turn the tables as well with their own kids. I can only hope that they think about it as much as my wife and I. Written on October 23, 2007 by Kevin. Written on October 19, 2007 by Kevin. Written on October 19, 2007 by Rylan & Kaitlyn. Happy Birthday to me! Well it was yesterday but either way, Happy Birthday to me! It has been a pretty exciting week, starting with my party on Sunday. It was amazing. I had a lot of fun dragging people over to the video games at Peter Piper. I like to sit in the car riding games. I also love to put coins in the slots. I even found one game that if you put a coin in and you don't win, your coin comes back out. Lets just say that I had a lot of fun with that one. To make it an even better day, I found a $5 bill on the ground. I put it in my pocket and just last night my mom bought me a Mr. Potato Halloween set that now goes along with my collection of other parts. Yesterday my Grandma came by and we hung out for a few hours. That was fun as always. She brought over some ice cream and even shared it with me. That's why I like Grandmas. She also brought me some apples so she was thinking healthy stuff too. Luckily I like apples. Kaitlyn really likes her as well and always gives big smiles to her. I think that is all for now. Have a great weekend. Written on October 18, 2007 by Kevin. It was about a month ago that I first wrote a review on Cici's Pizza. We were anxious for Cici's to have a location near us and were really pleased with everything when we had our first visit. It was affordable food for the family with a nice variety of pizzas. Their cinnamon dessert was amazing. We made a trip up there at the end of September to meet up with some of the grandparents, which turned out to be our last visit. I am standing in the buffet line waiting for a pizza to arrive that I request and that's when it happened. The teenage employee that takes the pizza out of the oven brushed his nose and then dug into it. I was amazed that he was doing this but in open view of everyone was just shocking. Did he wash his hands afterwards? No. I went back to my table in silence. After a short bit, I headed up to talk to a manager about the situation. The conversation went a bit like this. Me: Do all of your employees have a food handlers card? Me: Can you tell me why the guy that takes the pizza from the oven was just digging in his nose? Manager: Wow! I'll ask him. Manager: Yes he has his food handlers card. Thanks for letting us know. OK, great way to take care of the situation. I could not see the guy at this point but I didn't even see him leave to wash his hands afterwards. Amazing. Here is where the fun started. I called up the Cici's corporate number and let them know of the situation. I received a call from the district manager who wanted to know a bit further about the issue. I was told that the issue had been given to the franchise owner and that I would be contacted by him as well. This never happened. I called the corporate a few days later to complain that I had not received a call, they assured me a callback that day. It never happened. Everyone hears the horror stories and I understand that stuff happens to peoples food all of the time. The part that really urks me is that that guy saw me looking at him while he did it and he did nothing to hide it or attempt to clean his hands. Unfortunately the manager and owners were no better at taking care of the issue. Per the actions of the owner, my family will not be returning back to this Cici's. Thanks alot for ruining something good. This location is now gone. It all began with a tear.. Written on October 17, 2007 by Kevin. That is the face of discomfort. Normally that would either be the face we get if she had a dirty diaper or maybe if she is hungry but today, its because she has an eye infection. We noticed yesterday that her eye was just filled with tears and also that it was pretty pink. It seemed to have a bit of ooze as well so we decided to make a trip to the urgent care. Luckily it was pretty empty and we were able to get in fast so we quickly had the issue diagnosed and on our way. A basic eye infection they say. A week of eye drops should do the trick..
With the kids great grandmother in town, we knew we had to go get some pictures taken. This can always be a bit of a challenge. The first couple shots are fine but then Rylan tends to get fussy and is just done. At this point we usually have to scramble for 8 more poses before they will let us leave. We usually get some pretty odd shots but this time around we actually got a great looking one with Kaitlyn. Bright eyes and a cute smile, its a beautiful thing. Written on October 16, 2007 by Kevin. 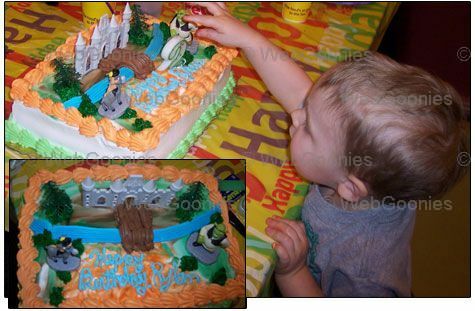 We ordered a Shrek themed birthday cake for Rylan's second birthday because he has been really into Shrek as of late. We ordered this cake from Bashas about 2 weeks prior to the party. We wanted to make sure that they had plenty of time to get it all completed without any troubles. A few days after we put in the order, my wife decided that it may be best that we get a 1/2 sheet cake rather than 1/4. We wanted to make sure that we had enough cake to feed the 26 people that we had initially invited. Everything was good to go. They confirmed everything including the Shrek kit that was necessary to make the cake. Fast forward to the morning before the party. My wife received a call from Bashas telling her that they did not have the necessary Shrek kit needed for the cake. This was not acceptable. My wife had held the kit in her hands during her initial order placement. Did they really use it on someone else's cake after we basically reserved it? After my wife forcing them to look and look, it took them 3 times looking but they finally found the kit hidden away somewhere. We were back on track after confirming the rest of the order. I stopped into Bashas that night to see if the cake was available to view and possibly take home. We wanted to make sure that everything was done right before the day of the party. The woman I spoke to was unable to find the order. You have got to be kidding me. After more arguing, we placed a second order in and confirmed everything once more. The second order was going to be used in the case that the other one had truly been lost and not just set aside by the morning baker. The day of the party, we get there at 9am to pick up the cake. My wife is amazed to see a 1/4 sheet cake come out instead of the 1/2 sheet that we had confirmed so many times. Can anything else go wrong? My wife complained more and they reduced the price of the cake nearly in half. This was the least they could do. We left Bashas just glad we had a cake at all. We were prepared to get there and they didn't have a completed cake. Overall, the cake tasted great. Visually, the baker did a pretty sloppy job and used oversized tips to pipe the frosting. We ended up having plenty of leftovers even with a 1/4 sheet because we had about half of the invited guest show up. Rylan was happy with it and that's all that really matters. A few emails and a phone call later, my wife spoke to the store director at our local Bashas. He apologized for the issue and understood how important a birthday cake is to the birthday party. He offered us a $25 certificate towards our next cake which we will hold on for Kaitlyn's first birthday. Written on October 15, 2007 by Kevin. This year we decided to have Rylan's birthday party at our local Peter Piper Pizza and it turned out great. Rylan had about 16 people show up this time around which included his grandparents, aunts and even his great grandmother. It was great to see how Rylan has advanced over the year. Last year, we had him sitting in his highchair covered in a big bib. He saw the cake and immediately served himself a nice piece by just grabbing for it. This year, he sat on the bench by himself. He saw the cake and only stuck a few fingers in. 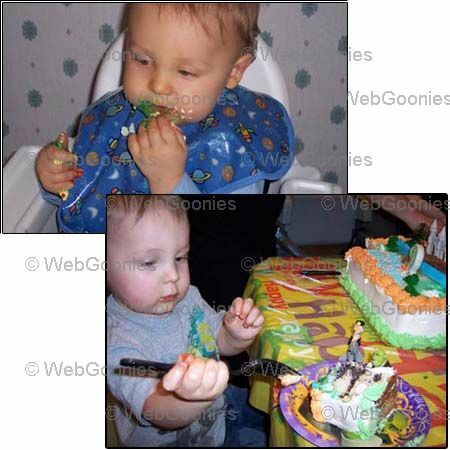 He grabbed for the plastic Shrek figures that were placed on the cake but otherwise the cake was in one piece. Last year, he ate with his hands while this year he is eating with a fork. He still got a bit of food on himself but certainly not what we were preparing for last year. He opened all of his gifts on his own this year compared to last birthday and Christmas which we had to do most of the work. As most kids do, he ripped off all of the paper, looked at the gift and then waited for the next one. He certainly enjoyed himself and has already showed interest in all of his new toys. I think Rylan's favorite part of the party was being with his grandparents and walking them over to the games. He loved pushing all of the buttons as you can imagine and really enjoyed putting coins into the machines. Written on October 12, 2007 by Rylan & Kaitlyn. My birthday party is on Sunday. I am so excited! Last night my great grandma came into town and that was great. In fact, she will be at our house all day today. 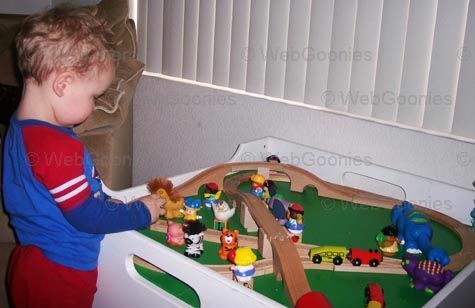 It's going to be really fun to show her my train table and I will probably watch Peter Pan with her as well. We all went out to dinner last night and at first I was so scared of her. She came over to me for a kiss and I wasn't having any of that. Who was this lady? Oh ya, she was my great grandma. It only took a bit before I was chatting away with her and handing her sugar packets. I'm a very giving boy. It was fun. Kaitlyn was all the fun at dinner. Everyone loved to hold her and she did really good. A bit of bad news in our neck of the woods. We were all set to move out and into a new temporary home when just the other day, the buyer told us that she had to back out. So now we have to wait for another person to come along that wants to buy our house. This is not good news at all. We already had to skip our first house we had built because our was not sold, will it be sold within the next 8 months? I don't know. Something a bit more exciting, my mom got me signed up for a 2-3yr old soccer class. I think it is going to be a lot of fun. There should be a bunch of other kids for me to play with and they have it all at the park so afterwards, I can go hop on a swing or down a slide. What could be better? That starts at the end of the month and I know my dad will be getting pictures. Oh I nearly forgot. Yesterday when my dad got home, we had a water fight inside our house! My mom was trying to get me to squirt my dad with a water bottle but it wasn't working out so she did it instead. He got her back by doing the old "I give up" trick. She went over to the kitchen and that's when it became really fun. I peaked my head over the wall and my mom blasted me with the water sprayer. It was so funny. I ran around laughing and laughing. I peaked over again and she did it again. It was the best time ever. I was soaked! That was really really fun. I think that's about it for now. Expect some birthday party pictures on Monday. It's going to be fun! Written on October 10, 2007 by Kevin. We have always been a pretty solid believer in buying diapers in bulk. We tend to buy our diapers from Costco or the occasional tiny pack from our local grocery store. We never looked too hard into buying diapers online because we figured the shipping charges would offset the savings of buying them for so cheap. A month or so ago, I saw a Diapers.com promo code that I had to check out. We were able to get Rylan and Kaitlyn a large pack of diapers for nearly the price of 1 pack at Costco. It was a definite smoking deal. We snatched it up and planned for its arrival. The next day, I received a voicemail confirming my order placement for an eBay sellers guide. Wha Wha What? I immediately looked at my bank account to see what was going on and I noticed 3 unknown transactions. I immediately called the bank and ordered a new card. I got the contact information for the 3 transactions and started making calls. It took days to get all 3 transactions reversed and quite a few headaches. Two of the transactions were for a book club that I certainly had not ordered through and the third was some eBay sellers guide company. The only benefit that I got out of this whole problem was that the books ordered on my behalf arrived and they told me to keep them. 4 expensive cookbooks and 4 expensive novels. They are now in use at our house or on Craiglist. The least they can do for wasting many of my days and the hassle of getting a new card. So where did these transactions ultimately originate? I cannot be for certain but based on timing and one other thing I believe it was Diapers.com that either stole the information or sent it to the other companies unauthorized. We live in a townhouse that includes a Unit # that I had put in a specific way on the diapers.com checkout. When I checked with the other companies, they told me it was the same way that I had put it through on the checkout. Bout as close to a smoking gun as possible in this case I think. In addition to all of this hassle, I was automatically subscribed to the Parenting Magazine via this website as well. During the checkout they ask if you want a free subscription which I had said no too. It was 3 weeks later when I received notice of my pending subscription. Needless to say, that has been cancelled as well. To say the least, Diapers.com will not be receiving my business any longer. At the time of checkout, I had given the information to a fellow employee here and I do have to say that at this time, she has not mentioned any fraudulent activities on her account. Was it Diapers.com or not? I'll likely never know but I'll stay clear from now on anyways..
Mark Lore, the CEO of Diapers.com, contacted me via the phone a while ago to talk a bit further about this issue. After laying out what I knew, we are still at a bit of a loss to know what the problem was and who is at fault. He agrees that there are certainly things that appear that they would point to Diapers.Com being the source of the problem but we will likely never know. He assures me that his company does not deal with any other companies except for the Parenting Magazine which does not get sent credit card information. I work for a company that deals with two major credit card companies and I work in a secure environment all day. I know how secure things like this need to be and from this view, it appears that Diapers.Com is doing what they need to do. As I said to Mark, I am not trying to smear the name of Diapers.com. I was trying to inform readers of the situation that I had that is or is not related to Diapers.Com. Ultimately, this is going to be an issue that gets forgotten about as it's going to be difficult to track down the ultimate reason. I certainly have a new respect for the company when the CEO himself rings me up. Will I be using their site in the future? Maybe if they have another great coupon but otherwise I think I will stick with Costco. Thank you Mark for taking the time out of your day to give me a call and talk about this. I appreciate the fact that you did not flat out deny the situation and can see how I came to my possible conclusions. Written on October 9, 2007 by Kevin. We have always known that we wanted to get Rylan a train table when he got a bit older. They just seem to be one of those toys that every kid is attracted to when they stop in at the toy store or book store. Rylan is no exception. We decided to start looking for affordable ways to accomplish a nice table. We had been looking on Craigslist for a few months now in hopes of finding the right table and tracks but came up with nearly nothing. We had hopes when we found a free table and tracks but when we picked it up, it needed a lot of work. Certainly not what we wanted to give him for a birthday gift. We continued to look and lucked out by finding a table at a pretty good price. Now we just needed some trains and tracks. We had no desire of getting Thomas tracks or trains which are ridiculously expensive. We looked up many alternatives and decided to try the LILLABO products from IKEA. We headed over there and picked up each of the sets. When we got home, we confirmed the fact that the table we purchased was small and was going to make it difficult to make a nice track setup. We pushed onwards and have now designed 2 nice layouts. More ideas will come before we decide to semi-glue it down so that Rylan cannot keep demolishing it like a mini Godzilla. As to be expected, Rylan loves this new toy. His Little People toys make a perfect addition to the table. We gave it to him a bit early for one of his birthday gifts. We think he will be enjoying this one for many more. Written on October 8, 2007 by Kevin. From the time you have your first child, you think your life is going to be filled with sleep issues. 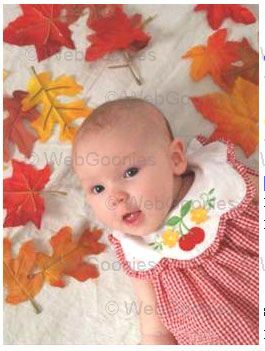 The baby is going to torment you the entire rest of the day. That is until you realize that really isn't the case. Newborns sleep a lot. I like to call it the transitional phase. The time where the baby is up for only about 8 of the 24 hours. It's a wonderful thing. As the month's go along, your baby begins to sleep less and less until they have grown up a bit and then they are only napping once a day. This is when you are put on the spot and expected to entertain or otherwise occupy this little kiddo. Miss Kaitlyn seems to like to sleep on Rylan's schedule. At 3 months old, she is taking about 2 naps per day now. This is almost as rare as Rylan. Rylan is now taking maybe 1 nap per day. Many days he won't even take one. Sometimes this results in them being fussy and other days they are perfectly normal. I don't think Rylan was up this many hours per day at only 3 months like Kaitlyn. It definitely keeps things interesting during the day. We used to be able to rely on a car ride to soothe and help Rylan fall asleep but Kaitlyn is different. She can drive miles without a wink. As much as I love her smiling face, sometimes I would like to see her sleeping peacefully. Two kids later, I still haven't found the magic sleep button. Written on October 5, 2007 by Rylan & Kaitlyn. Did you see they just recalled a whole bunch of new toys? Well, my mom noticed that they had recalled the 10-in-1 activity cart which was a toy they got me about a year ago that they were holding onto until I got older. Well a few months ago they let me have it. I got my arm stuck in it so they took it away from me which was a good thing since it now is recalled because of excessive lead. My dad made sure to check the recall list when he was putting it together because he just had a hunch that it was going to be a problem. They threw it out in the trash a few weeks ago. Luckily I didn't play with it much. I have always been a fan of those wooden train sets they have at the bookstores and I know that my mom and dad wanted to get me one. They had been looking online for a long time trying to snag a deal and the other day my dad found a used one on Craigslist for free. We picked it up and boy was it pretty bad. The person who put it together was crazy. They used a lot of glue that was oozed out all over the board. It was in bad shape. I am not sure yet if they are going to keep that train for me and redo it all or just get me my own new one. Of course I will share with little Kaitlyn when she gets big enough. Only 9 more days until my birthday party. I am super super excited. We are going to have it at Peter Piper Pizza this year which is going to be a blast. My cousin is going to come too. He is a month or so older than Kaitlyn so that's pretty exciting. I know last years party was really fun so I can only imagine this one will be even better. We went out birthday shopping with my grandma last night. It was fun to run around Toys'R'Us telling my grandma what I wanted. Written on October 4, 2007 by Kevin. National Museum Day was last Saturday. This is the day that some museums open up their doors to everyone for free. The only problem is trying to find a museum that atleast semi interests you. There are few here in Arizona. I have heard things about the Desert Botanical Garden museum and decided we may check it out. For the Christmas season, they decorate the pathways with lights and make a big deal of it. People say it's nice so I was hoping that a normal visit would be equally as nice. We packed up the kids and made a short drive across town. Up until recently, its been scorching hot outside but on Saturday it wasn't too terribly bad. Heat with a bit of wind. We checked in and confirmed our free tickets. We ordered additional entrance tickets to the butterfly exhibit they have going on. We figured Rylan would get a kick out of this. We made our way through the start of the pathways. Hello cacti. When they say this is a garden, I must not have been thinking clearly because all I saw was random cacti, bushes and trees. Sure, some of the things were new to me but dang it looks like I stepped outside. We continued on for a bit more until we were just bored. There was little for Rylan to look at except the occasional lizard running by. We headed towards the butterfly exhibit. After a bit of warning to watch the stroller and not run over any butterflys, we entered. There were definitely a lot of butterflys and Rylan got a kick out of the ones on the ground. We talked a bit about them with Rylan and tried to make the best of it. I don't think that we will be taking the kids back to the museum anytime soon. I imagine there are some people who enjoy this type of thing but it seems that we are not those type of people. I am still trying to find a kid friendly museum on our side of town. Atleast I can say I took a nice photo of a butterfly. Written on October 3, 2007 by Kevin. Written on October 2, 2007 by Kevin. We had an exclusive meet and greet with the 2 of them. We had about 5 minutes of uninterrupted time. It was really nice seeing as that day had begun pretty badly including parking and park entrance issues. Written on October 1, 2007 by Kevin. One of the benefits of having a second child is the ability to know what to expect. Through all of the crying of a newborn, you know that someday soon, the crack of a smile will emerge which will change everything. How can you even get a bit upset with a baby when they turn around and smile at you. It's impossible. Kaitlyn is now working on her smile and learning just how effective it is. My wife noticed that she would smile only in the morning but now it's an all day thing which makes me happy since I am unable to be at home when they wake up in the morning. The hard part now is not getting her to smile, it's getting her to hold it long enough for us to get pictures.